By the time of the 1913 reunion, the Union half of the commemorative landscape at Gettysburg was already established in the form that exists to this day. While veterans and preservation societies erected a handful of memorials honoring Union soldiers during subsequent decades, the overwhelming majority of regimental, state, and individual markers were dedicated before the 50th anniversary of the battle. When the wizened veterans of the Army of the Potomac returned to the site of their youthful valor in 1913, over 1,000 monuments, interpretive tablets, and gravestones defined the geography of hills and fields in the vocabulary of regiments and headquarters. HERE THE 20TH MAINE REGIMENT COL. J.L. CHAMBERLAIN COMMANDING, FORMING THE EXTREME LEFT OF THE NATIONAL LINE OF BATTLE ON THE 2ND DAY OF JULY 1863, REPULSED THE ATTACK OF THE EXTREME RIGHT OF LONGSTREET’S CORPS AND CHARGED IN TURN, CAPTURING 308 PRISONERS. THE REGIMENT LOST 38 KILLED OR MORTALLY WOUNDED AND 93 WOUNDED OUT OF 358 ENGAGED. THIS MONUMENT, ERECTED BY SURVIVORS OF THE REGIMENT, A.D. 1886, MARKS VERY NEARLY THE SPOT WHERE THE COLORS STOOD. Like dozens of other Union regimental monuments, the 20th Maine monument’s form and content would not be out of place in a family burial plot at any garden cemetery in America. While many, like the monument to the 19th Indiana Volunteer Infantry, are slightly more elaborate in form, the majority of Union regimental monuments at Gettysburg are geometric granite blocks with minimal sculptural decoration. Excluding statues of individual generals, fewer than thirty of the 1,000 Union monuments at Gettysburg incorporate a bronze or granite soldier atop a stone pedestal, and these few sculptural soldiers are markedly more dynamic than their town square counterparts. At Gettysburg, the lone infantryman is rarely relaxing at parade rest. Instead, he is running forward, loading his rifle, or swinging it by the barrel as if it were a club. In the case of the 73rd New York Volunteer Infantry, which was made up of New York firemen, the soldier is joined atop his pedestal by an embodiment of his civilian identity. Still, these soldiers are merely Savage’s young, white models of American manhood in motion, rather than in repose. Only on very rare occasions does death or suffering mar the Union infantryman’s stoic heroism, and in these cases, that death is depicted by life-size figures whose pristine uniforms are hardly wrinkled by their ordeal. Since most regiments were deployed to more than one location over the course of the battle, veterans had several options when considering where to place their regimental monument. The GBMA attempted to standardize monument placement by requiring that regiments place their monuments in line of battle, but some veterans groups ignored the guidelines. 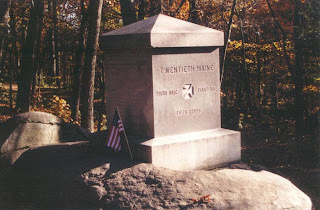 In 1891 over the objections of the GBMA, the 72nd Pennsylvania erected their monument in a place of honor at the Angle, even though other veterans maintained that the regiment had beat a hasty and dishonorable retreat from that position in the face of the enemy (Desjardin, 163). In general, survivors erected monuments either at the site of their most furious fighting or at the point of farthest forward advance, which were often the same place. For example, the 114th Pennsylvania Volunteer Infantry (Collis’ Zouaves) placed their monument near the Sherfy House on the Emmitsburg Road, more than a mile in front of the main Union line. Even though the regiment fought in many parts of the battle, including the repulse of Pickett’s Charge on July 3rd, the survivors chose to erect their monument near the site of the Sherfy family’s barn, where they had suffered their heaviest casualties, due in part to the barn’s catching fire and consuming wounded men who had taken shelter there. In addition to the regimental monuments erected by veterans’ groups, two Northern states, New York and Pennsylvania, built larger monuments to commemorate their soldiers’ part in the battle. Both are deliberately constructed to instill awe in the visitor. The New York Monument (1893) towers over the New York section of the Gettysburg National Cemetery. From a height of 93 feet, the female embodiment of the state looks down upon her fallen sons. 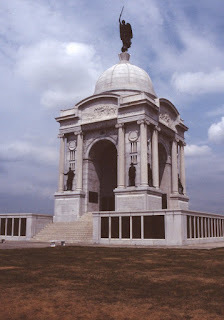 The Pennsylvania Memorial (1910) is even grander (see image at right via). The 110-foot tall granite cathedral is adorned with eight 12-foot bronze statues, four massive bas reliefs depicting the four branches of the service, bronze plaques listing each of the 34,530 Pennsylvanians who fought in the battle, and crowned with a 21-foot statue of Nike triumphant. To behold these massive memorials is to stand in awe of the rich and powerful states that built them. Their grandeur reminds visitors that the states that built them are powerful military entities with resources sufficient to spend vast sums of money (over $180,000** in the case of the Pennsylvania monument) on memorializing their soldiers in addition to arming them. *If you do an image search for "Gettysburg monument," you'll see a lot of fancy sculpture, but that's mostly because those monuments are the flashiest. Virtual Gettysburg has photos of all of the regimental monuments on the field and most of them are less exuberant.